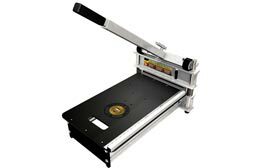 At RubberFlooringInc we offer a number of EZ Sheer tile cutters that are great for many types of floors. These tiles cutters are very easy to transport and can be used in areas where other powered cutters can not. 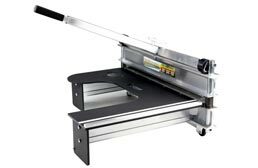 We offer three types of tile cutters that are available in several different cutting widths. These flooring cutters are great for cutting plastic flooring, as a laminate flooring cutter, as a vinyl tile cutter, and as a carpet cutter. Our tile cutters are great for cutting both hard and soft flooring. We offer three series of tile cutters: EZ Shear, Magnum and Pro Magnum. All three series of flooring cutters can cut both hard and soft flooring. 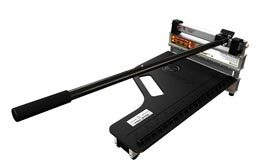 However, the main difference between each tile cutter is the maximum size they can cut. Below are the max sizes each tile cutter can cut. Our tile cutters are a great alternative to electric saws because they produce no dust and no electricity is required. Whether wet or dry, our tile cutters can be used, which can’t be said about all electric saws. Our tile cutters are lightweight and can be carried and stored with ease.